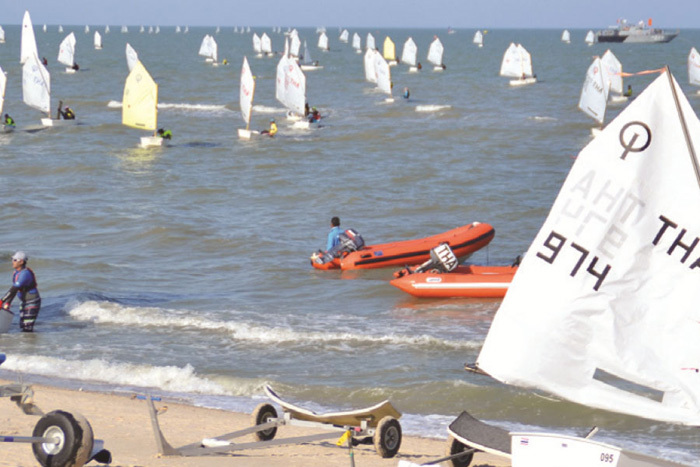 The organising authority is The Yacht Racing Association of Thailand (YRAT), in conjunction with the Royal Thai Navy, Tourist Authority of Thailand, Cha-Am Municipality and Phetchaburi Province. During the Regatta Royal Thai Navy ships will chaperone the fleet off-shore and the eager helping hands of navy sailors providing the first greeting for returning competitors. In April, 1966, His Majesty King Bhumiphol Adulyadej sailed single-handed his OK Dinghy which he had built himself from Klai Kangwon Summer Palace in Hua Hin, travelling 60 nautical miles before arriving on the Toey Ngam Beach in Sattahip, Chon Buri. come the first person to achieve feat in an Optimist. The Optimist is a small, single-handed sailing dinghy intended for use by children up to the age of 15 and one of the most popular sailing dinghies in the world, with over 150,000 boats officially registered with the class. As a point of comparison the length of an Optimist is 2.36 metres (7 ft 9 in), whereas an OK dinghy is 4.00 metres (13.12 ft).